Dedicated Power, No More Noisy Neighbors! 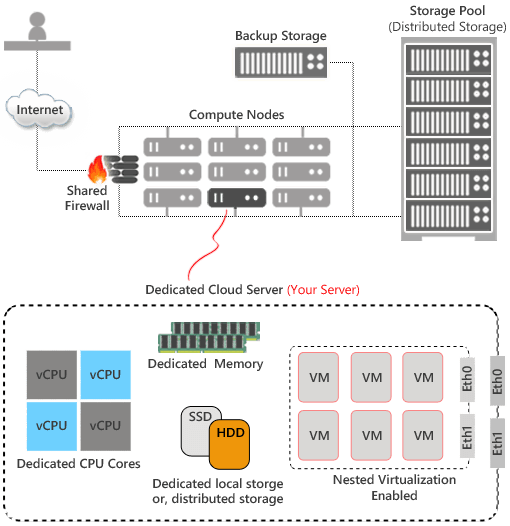 Conventional dedicated server combined with cloud features. Enhance overall usage experience. you can choose between dedicated local storage or distributed storage. Note: Failover is only available on distributed storage allows full hardware performance. Preserve the state of entire server including memory onto your own storage. Rollback to the same state at anytime. SSD-cached Ceph distributed storage, up to 10TB per single drive to your server as additional drives, usually use as backup or database drive. allows to run VM inside virtualized dedicated cloud server. This is useful when establish testing or development environment enabled, allow you to run multiple VMs within your dedicated hardware. that dedicated to your server, without sharing to other tenant. * Game Server, Torrent, P2P, or Streaming Server is NOT allowed to host on above server plans. * Indicated bandwidth is on best effort basis. Standard bandwidth come with 90% local / 10% international mixed. You are allowed to burst up to allocated bandwidth for short period of time (approx. 2GB of data). Consistently utilize bandwidth more than 30Mbps, your server will permanently cap at 30Mbps.